Editor's note: This is the first in a series of articles on key and lesser-known figures in the Villisca axe murder event and/or investigation whose final resting place is the Villisca Cemetery. It's partly inspired by a cemetery tour given by Dr. Epperly for visitors during Villisca's 2002 Commemorative Weekend. This online "virtual cemetery" will provide information not available anywhere else. It will be a road map to an informed visit to the actual cemetery for those in search of a true crime that rivals better-known unsolved mysteries such as Lizzie Borden and Jack-the-Ripper. Eventually, we will add a diagram to help you find particular monuments. He said that because Alice was the only witness who would testify under oath that she overheard suspect William Mansfield and Iowa State Senator Frank Fernando Jones plotting the murder. The rest of Kansas City Burns Agency Detective James Newton Wilkerson’s case consisted of snippets of conversations, suspicious movements, and tortured inferences. Only Alice was willing to stand in the witness box and swear lives away. Everyone in Villisca knew Alice had seen strangers in her neighborhood, a block south of Joe Moore’s house, on Saturday and Sunday before the murder. But no one suspected she would surface as Wilkerson’s star witness in his slander suit defense, a civil case filed by F. F. Jones. In that testimony she claimed to have crouched in a plum thicket with a traveling salesman named Ed MacCrae on the Saturday night before the Sunday murder. She and Ed had been on a late evening drive when their car broke down leaving them stranded directly behind Joe Moore’s house (photo below). When they saw the three strangers she had seen outside her house that morning, she became frightened and pulled Ed behind the bushes for safety. 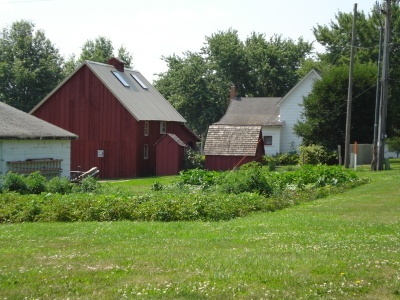 The three strangers were met by F. F. Jones and Bert McCaull just a few feet in front of the plum thicket. Close enough that Alice testified she had heard one man say, “Get Joe first and the rest will be easy." On testimony such as this, Wilkerson prevailed in the slander suit. He also won the allegiances of a majority of Montgomery County citizens who were convinced the wealthy politician Jones was behind the Villisca axe murders. Making good on a campaign promise, newly elected Montgomery County Attorney Oscar Wendstrand convened a grand jury in 1917 to finally settle the murder question. Alice was again the star witness, although she now told a more lurid tale. Apparently she had withheld information in the 1916 slander suit which she now revealed to the 1917 grand jury. Alice claimed to have heard the plotters planning to catch Joe and Dona together so that they could sexually assault her and castrate him. Obviously if either of these overheard-conversations were true, Jones and his four co-conspirators were guilty. But Iowa’s Attorney General Horace Havner was convinced Alice was lying. That conviction was based on several factors. First, authorities were suspicious because she had not come forward sooner with this horrific allegation. After all she held the key to the entire case, the most notorious unsolved murder mystery in Iowa history, and had kept the incriminating secret for nearly five years. Jim Atkinson, a long time friend of Alice, also reported she had told him that Wilkerson had offered her $400 for her testimony, but she was holding out for $1000. In addition, the state fretted over the fact that no one could corroborate Alice’s testimony. Her salesman friend, Ed MacCrae, was nowhere to be found. Search as they might, he had left no footprints. Neither could they ask her girlfriend, May Freeman, who was with her that fateful night, for May had died shortly after the murder. Frank Robinson, another old friend, had listened as Alice told the story in September of 1916, but unfortunately, he slipped into a coma a week later and died from Bright’s disease that fall. Finally, the most telling objection Havner had to Alice’s story was when she first told it she had Albert Jones, not F. F. Jones, meeting the hired killers. Later, when it became known Albert had an iron clad alibi for the night in question, Wilkerson offered a convoluted explanation why Alice had inadvertently substituted Albert for Frank Jones. Lying or not, Alice proved a tough witness, as she and Attorney General Havner had some monumental battles in the grand jury room. It got so heated that Havner himself was indicted and had to fight the charge of oppressing Alice as a witness. The case was thrown out of court, but it showed what conflicts her testimony provoked. Undoubtedly, the low point in this clash came when she expressed a need to go to the bathroom. Havner, himself a hard-bitten prosecutor, kicked a spittoon in her direction and said, “Use that.” When Wilkerson’s case collapsed before the 1917 grand jury, Alice’s days as star witness were finished. Reverend Kelly’s defense lawyers tried to introduce the Wilkerson case against Jones as their defense, but the judge ruled it not germane to the question of Kelly’s guilt. 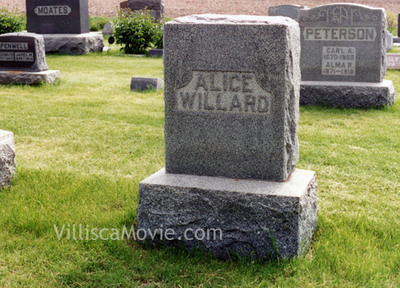 Alice herself was an obscure woman who would be completely forgotten today had it not been for her role as an alleged conspiracy witness in the Villisca axe murder mystery. In 1912, she was living with her father Henry Holland a block south of the murder house. She had been married to Lewis (Lou) Willard, a brakeman on the C, B, & Q (Chicago, Burlington, and Quincy Railroad), but because of domestic violence she had left him some years earlier and moved back to her father’s house. In 1912 she enjoyed a very poor reputation in Villisca. Years later it was said that, “She found her entertainment in a ditch.” During the slander suit Mitchell, Wilkerson’s attorney, made the mistake of asking George Winters on the witness stand. Winters testified that Alice had a bad reputation. Winters proceeded to rattle off a long list of alleged paramours. After the trials Alice (photo below) traded notoriety for obscurity but she had little time left. In 1921 after an illness of a month, she died at home. The funeral was held in her house, just two blocks south of the plum thicket where she claimed to have spent a fearful and eventful Saturday night in June of 1912.